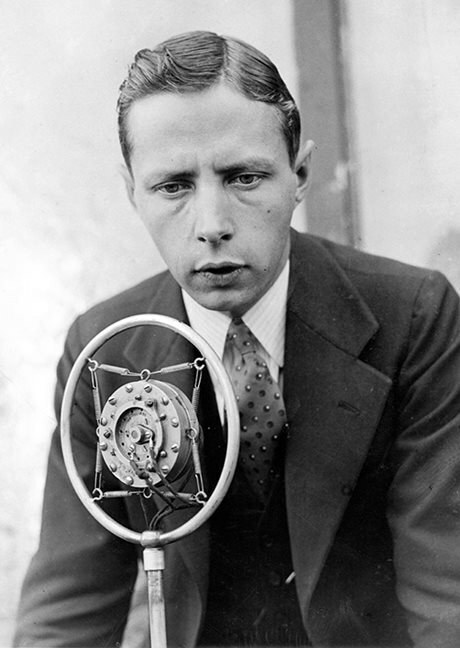 The voice of Foster Hewitt (1902-85) was one of the most recognizable in Canadian sport, especially in the hockey world where he served as the official broadcaster for the Maple Leaf Gardens for 27 years. Hewitt was the son of William Hewitt, a Toronto Star newspaper sports editor and founder of the Ontario Hockey Association. The younger Hewitt was hired as a sports announcer by the Toronto Daily Star’s radio station in 1922. His first live hockey broadcast was on February 16, 1923 at the Arena Gardens (Mutual Street Arena) in Toronto. Hewitt did play-by-play broadcasts for numerous sporting events until Conn Smythe gave him sole broadcasting rights from his own gondola at Maple Leaf Gardens in 1931. He became a pioneer in hockey broadcasting and served as a symbol of national unity for hockey fans across Canada. Hewitt coined the now-famous phrase “He shoots, he scores!” that is still used by announcers to this day. Watch a CBC interview with Hewitt and his family from the Hockeygods website. Learn more about Hewitt from the Hockey Hall of Fame website. Watch Historica Canada’s Heritage Minutes video on Hewitt.